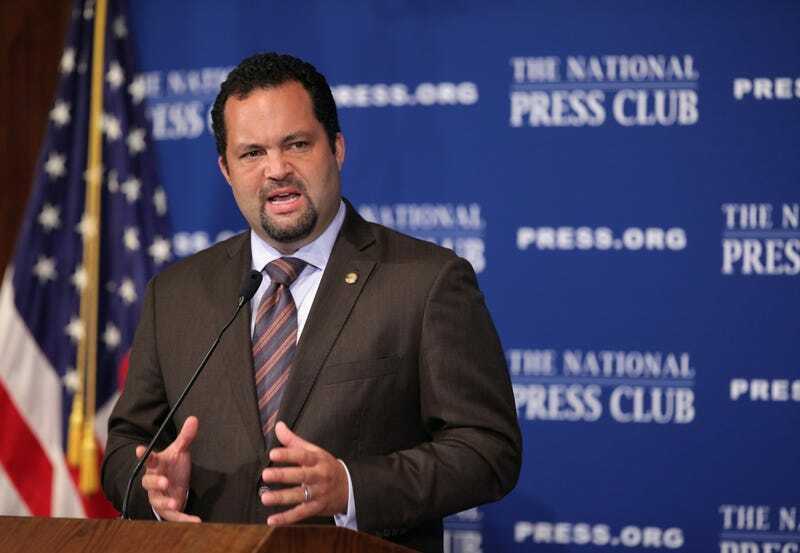 Could Ex-NAACP Leader Ben Jealous Become the 1st Black Governor of Maryland? Former NAACP President Ben Jealous knows that even after emerging victorious in a crowded Maryland Democratic primary on Tuesday to crush Rushern Baker by more than 10 percentage points, he still has a fight on his hands. That’s because the current governor of Maryland, Republican Larry Hogan, is shockingly beloved in an overwhelmingly Democratic state. Hogan not only proudly boasts that he didn’t vote for Donald Trump, but is even being touted as the “Un-Trump Republican” by the Washington Post for his refusal to blindly go along with the dictator in chief just because he, too, is a Republican. Hogan’s approval ratings hover around the 60s and topped out at 71 percent in January, according to the New York Times. And a Washington Post poll has Hogan ahead of Jealous in a hypothetical election by 12 points. But Jealous knows that hypothetical words always get thrown before hypothetical punches. And he’s ready for a fight. Jealous has never held an elected office, but he’s not letting that stop him. And had he listened to pundits before entering the Democratic primary, he very well may have just withdrawn his name altogether. That’s because well-liked and well-known Prince George’s County Executive Rushern Baker, who had the backing of top Maryland Democrats including Sen. Chris Van Hollen, Rep. Steny Hoyer and Attorney General Brian Frosh, was supposed to take the election handily. Well, just like the triumph of Alexandria Ocasio-Cortez in New York, what’s supposed to happen doesn’t always go as planned. Ocasio-Cortez stunned the Democratic establishment by trouncing the plans for Rep. Joseph Crowley (D-N.Y.) to become the next big name in the House. It appears that there may be a new dawn on the horizon, where people are tired of the status quo and looking for fresh, energetic, progressive faces to pump new blood into a stagnant system. Consider it the anti-Trump effect. “His risky and irresponsible schemes would require massive middle-class tax hikes that would wreck our economy and put thousands out of work,” Scott Sloofman, Hogan’s communications director, told the Times. Anything can happen between now and November, but however it shakes out, Jealous isn’t going anywhere, and it might be time for the people of Maryland to take a long, hard sniff at a breath of fresh air.